What can I say? I'm a major Hammerfall fan, and their seventh studio album No Sacrifice, No Victory is great. Pundits and naysayers be damned, this is truly epic, tried and true melodic power metal. This is also the first album with new guitarist Pontus Norgren (recently ex-Poodles) on lead guitar. And let may say that this is one smashing debut by Mr. Norgren; he really rips it up throught this album. However, some Hammerfall fans may be a tad disappointed with No Sacrifice, No Victory simply because it's not quite as heavy as some of its predecessors. From the opener 'Any Means Necessary' through 'Something For The Ages,' Hammerfall's course is pure melodic heavy metal in a classic sense. The songs build magnificently with epic vocals and vocal arrangements undergirded by harmonious arrangements and then topped with brilliant fret sizzling guitar solos. The real meat is found on four masterful pieces beginning with 'Legion' and continuing through 'Something For The Ages,' all of them are heroic, epic and immensely entertaining. I'd love to hear them live. 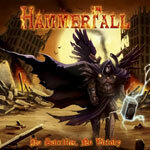 But don't think Hammerfall has lost any of it's heaviness; the stronger more power metal riffage come on the roaring title cut and the equally brillian 'One Of A Kind.' Finally, Hammerfall is known for their homages to predecessors and peers alike, so hearing them pull off a power metal version of The Knack's 'My Sharona' was quite, well, interesting. Maybe it was Norgren's post Poodle influence that ruled the day. Honestly, I loved every bit of Hammerfall's No Sacrifice, No Victory but, of course Constant Reader, you know my predelection for European melodic power metal. No apologies, No Sacrifice, No Victory is great stuff. Highly recommended! Honestly, I loved every bit of Hammerfall's No Sacrifice, No Victory but, of course Constant Reader, you know my predelection for European melodic power metal. No apologies, No Sacrifice, No Victory is great stuff.